For many years, Tzfat was the most hospitable city in Israel for Jews to live. Beginning with the Jews who returned to Israel after the Spanish and Portuguese Expulsions in the late 1400s, Jews who chose to come to Israel had few choices. Economic opportunities for Jews were limited in Jerusalem and by the 18th century, the ruling Turks would not allow Ashkanazi Jews to live in Jerusalem at all because of a collective community debt. Hebron was even more desolate, and the Jews there were prone to frequent attacks by the surrounding Arab population. So most Jews chose to come to either Tzfat or Tiberias, in the north of the land. Such was the case with the Amiel family, who came to Tzfat from Portugal in 1606. For eleven generations, this family lived in Tzfat, through the best of times, as well as through earthquakes, pogroms and famine. 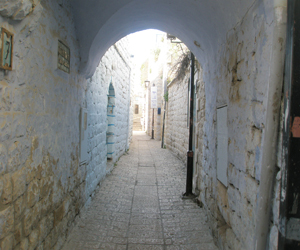 Today, David Amiel, scion of this family, guides tour groups through the lanes of Tzfat's Old City and Artists Quarter. He sees his work as an important part of his heritage, and isn't content to simply relay the history of the city and its sites.....he imbues his clients with information about the city, its customs, traditions, background, and spirituality. He walks the streets of the city while leading these visitors in song, and always has many stories and legends to tell about Tzfat. David's background gives him a unique background and ability to give visitors a full tour. His family history gave him a particular interest in Tzfat's history, and his academic credentials include a M.A. in History and Philosophy, with his Master's thesis on "The Influences of Kabbalah on the Shabtai Tzvi Movement". (Shabtai Tzvi was a false messiah of the 17th century who misled a huge segment of the Jewish World, including many great Rabbis, of the day. When he was denounced, and subsequently converted to Islam, it was akin to a spiritual catastrophe for the Jews of the day, who had been misled by Tzvi, as well as their own leadership). Because Tzfat was such a huge center of the Jewish community of Israel throughout the 15th - 19th centuries, their descendents can today be found scattered throughout the world, and it is not uncommon for people from lands as far-flung as Australia, Brazil, South Africa, and everywhere in-between to arrive in Tzfat asking if "anyone knows where my great-great-great-grandmother Zissel Goldenfarb's house is" and "does anyone know if there are any descendents left in Tzfat?" The person who is best equipped to answer those questions is, of course, David, who doesn't bother with the records and archives that could be researched. His own studies have given him an almost-encyclopedic knowledge of where the Goldfarb house was, as well as which Goldfarbs married whom, who moved where, and where family connections might be found. Numerous times, with no request for compensation, David has made himself available to visitors to help them research their family histories in Tzfat. He has never been known to make a mistake. David is as enthusiastic in his work today as he was when he started seventeen years ago "Today" he says "tourists aren't content with just hearing about the history of Tzfat. They want to feel the city, to know about Kabbalah and mysticism, to learn about the art of Tzfat, and to understand the religious community here. That's what I'm here for, and it's my pleasure to be a part of their visit here". To contact David: (054)319-8923 or [email protected] David guides in English, Hebrew and French.